We are currently accepting applications for travel awards. Overview: Students, departments, and the university benefit when undergraduate researchers present their work at discipline-specific conferences or appropriate artistic venues. To support travel by students who are presenting their scholarly or creative work, and who have exhausted all other options for fully funding the anticipated costs of conference participation, new matching funds are now available. Students must be degree-seeking undergraduates in good standing. Priority will be given to work done in the context of a credit-bearing course or a non-credit-bearing arrangement, at UMBC. The student’s work must have been accepted for presentation at the conference or arts event. General attendance, without presentation, is not supported through this fund. Students must submit a letter of acceptance from the conference host, along with their Travel Award application materials, confirming that their presentation has been accepted. Funding is for presentation of results, not for collaboration, training, or professional development. Requests must be submitted in advance of the travel. Note: The approval process takes about a week and the process requires another four weeks to release funds from the university once your request is approved. Therefore, requests must be made at least 5 weeks in advance of the travel date. Retrospective requests will not be accepted. Students are expected to share the benefits gained from the conference with the UMBC community. In general, this will minimally include presenting the research at URCAD and through appropriate department venues and/or submission to the UMBC Review. 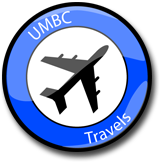 Approved travelers must submit a short report to the Office of Undergraduate Education within two weeks of the conference explaining the value of the event to the student and to UMBC and confirming campus dissemination plans. Support form must be submitted by a UMBC faculty mentor. “The travel grant funding from OUE allowed me to attend a conference in Boston, MA where I gave an oral presentation at the Materials Research Society Fall Meeting. I was fortunate to have my paper published in the conference proceedings. It was a great experience to meet professionals and faculty researchers in the field who gave me feedback on the work and also helped me connect with professors in the graduate programs where I was accepted. It is anticipated that this funding will supply matching funds to support the participation of students at regional or national conferences. Students may apply for conference presentation travel funds up to $750 in matching funds or up to $500 in unmatched travel funds. This program does not fund membership fees or the cost of participating in events related to the conference such as banquets or other special events. Transportation, hotel, and meal costs are eligible for funding. Proposals will be evaluated based on anticipated benefit to the applicant and UMBC, demonstrated need, and efforts to obtain matching funds from other sources. A key element is the student’s post-conference/event dissemination plans at UMBC. Preference is given to sophomores and juniors who will have more time at UMBC to share the positive results of their experiences. Preference is also given to first-time presenters, that is, those who have not previously presented at a national or regional conference or arts event and have not been funded before by this program. The conference/ arts event participation is to be an educational experience. As such, while not required, co-attendance with a mentor is a positive factor in judging the benefit to the student. Here are a few places where UMBC students have presented their work!